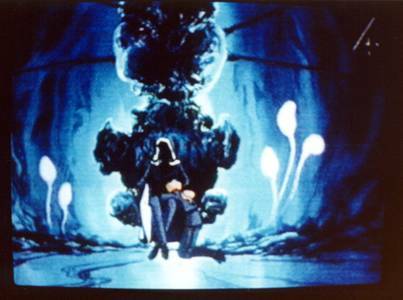 (pictures on this page from Dark Kingdom Playground and Stayka's Dark Kingdom Home). That's pretty much Zoi's first appearance, I think. And right away I sat closer from my TV and thought "Uh oh... Now THAT looks interesting..."
Imagine. Androgyn cuteness mixed with psychopath instinct and definite mocking spirit, I had to love that. Actually, before he appeared, I was looking at the show quite distractingly. I was starving from anime and this was the only new thing aired at the time, so I endured the watching of quite repetitive "Monster of the Week" first episodes, hoping it might spice up. And Zoisite rewarded that wait, oh yes he did. I don't lust after him (especially as he looks as gay as Mr Gay and I'm not one for lost causes ^_^ ), but I'm really really fond of him. I just fall for cute killers, go figure. I think it's because I relate instantly to someone who appears "cute" and can't scare anyone physically, but who is in fact a total psycho that you should not turn your back on (because let's face it, that's me in a nutshell... Except I'm far from being as cute as Zoi *pouts*). 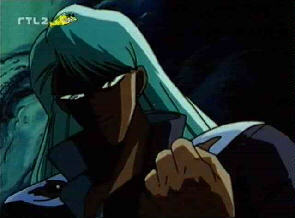 Zoisite's own assignment was to find the Ginzuishou in order to free Metallia from her prison. 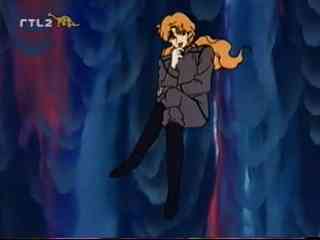 But after a few episodes, Nephrite, who used a black cristal to spot people whose energy was at its top, decided to try and find the Ginzuishou with it, hereby taking over Zoisite's mission. Much to this one's distress. No, it's not what you think it is. Remember that this is a show for kids. Around age 10, I think. 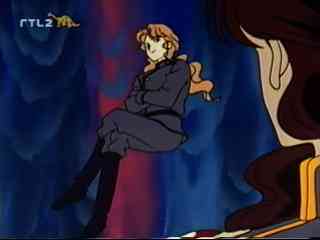 So in fact, Zoi had gone straight from the throne room to what turned out to be Kunzite's castle, and to find some comfort in his company. 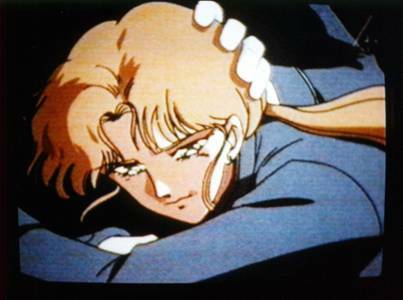 He was sitting at his feet, crying, and Kunzite stroked his hair gently, reassuring him and telling him that they could get rid of Nephrite in time. We learned all at once that he was the Shitennou's leader, the most powerful (he literately radiates power), and he was also engaged in a peculiar relationship with his lieutenant, even though all we'd seen about Kings so far was all about treachery. 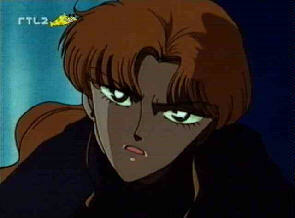 And he also, for some reason, was the object of Zoisite's love, something that most people would have doubt existed before he appeared... Zoi being definitely a quick-tempered homicidal youth who seems to hate everyone and everything but himself... and Kunzite.